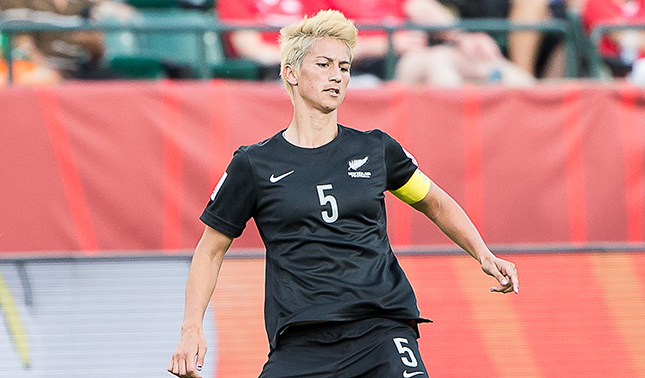 Western New York Flash defender and New Zealand captain Abby Erceg will be heading to Rio this summer after the Football Ferns qualified for the 2016 Summer Olympics yesterday. The Football Ferns were set to take on Papua New Guinea today in the second leg of the 2016 OFC Olympic Qualifying Tournament, after earning a 7-1 win in Leg 1. However, Papua New Guinea withdrew from the matchup. The forfeit gave New Zealand the tournament’s championship title, thus earning an automatic bid to the Rio Olympics. In lieu of the second match, New Zealand faced an Invitational XI in an exhibition game and came away with a 5-0 win. The Western New York Flash is one of ten members of the National Women’s Soccer League. The club won the inaugural NWSL Shield after finishing the 2013 with the best regular-season record. Fans can keep up-to-date on the most recent Flash news by following the Flash’s official Twitter account (@WNYFlash) or by liking the team’s Facebook page.